’Rupert’s Needle’ - A public monument to mark the closure of a British Army school in Germany. 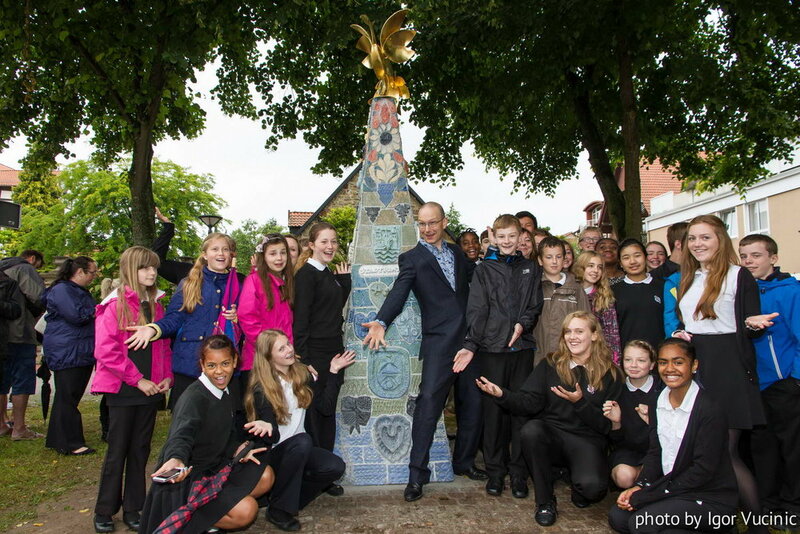 Pupils and staff at Prince Rupert School collaborated to encrust the surfaces of the obelisk with glazed ceramic crests of their own design. The school was one of the first established soon after WWII to exclusively educate the children of British military personnel stationed in Germany. The obelisk stands under trees on the corner of a square in the small town of Rinteln in Lower Saxony. A phoenix rises from the crest of Rinteln Town. It is 24 carat gold on aluminium (paid for by the school). Made to be carried in hand luggage on the plane! The ceramic surface is made up of relief crests and shallow tiles which are all made by pupils and staff of the school. The crest of the small medieval town by the river Weser. The obelisk (under the trees) was partly inspired by the spires and beautiful stone work of the old town’s churches. With four sides the obelisk is made up of several hundred hand made pieces. We were honoured to be given a beautiful central location in Rinteln. The sculpture remodels a classical memorial and traditional heraldic symbols. Taking elements from the old town, the badges of the army and adding symbols invented by the pupils and staff of the school. The project provided a positive focus as the campus prepared for closure. Pupils and staff modelled their own clay crest designs which represented elements of their lives in Germany and their home countries. Every pupil in the school designed their own crest. A smaller group then worked on modelling their in clay. There was a pride and recognition of heraldic symbols amongst the soldiers’ children. The scale of the sculpture meant we also needed a lot of tiles to fit around the crests. It was a laborious process of cutting and fitting decorated tiles around the crests before firing and glazing. Pupils carved lettering and dates that recorded the history of the school. Piecing the tiles around some fired crests. A loving crest by a year five pupil: sun from her home country of Fiji, a ball for sport, a Play station controller and an ice cream from the Eisdiele parlour in Rinteln. Workshops engaged pupils and staff to design and then carve and model their own coats of arms incorporating elements from their time at the school in Germany and their home countries in the UK, Fiji, and Tibet. Travelling back and forth to Germany nine times for short visits was challenging but all difficulties were overcome with the essential assistance of the dedicated school staff. Colonel David Kelly gave a speech at the unveiling of the sculpture. The opening coincided with the closing of the school. The deputy mayor attended the opening and took a great interest in the genesis of the piece. The sculpture with the church spire in the background. Posing for the press with some of the pupils that helped make it all happen. The opening was well attended by old pupils and local people, with performances by pupils and speeches. To read Colonel Kelly’s speech click here. The local press covered the event here. Many thanks are due to the dedicated support of the school staff and the also to the local Burgemeister (Town Mayor) and his office, who’s support grew as the project developed until eventually we were given a beautiful location in the old town.